Anokiwave | 5G is here.. Are you ready? The 24.25 – 27.5 GHz range, referred to the as the 24 GHz band in the U.S. and China and the 26 GHz band – deemed the Pioneer Spectrum band in Europe, joins 28 GHz and 37/39 GHz as the emerging 5G mmW bands worldwide. Looking at the below graphic, we see the world converging on these three bands. Anokiwave is ready now for commercial 5G deployments with our second generation family of ICs, following years of experience executing on an aggressive strategy to develop and deliver the technology needed for mmW 5G networks. We offer highly integrated Silicon ICs with embedded functions for remote telemetry and fast beam steering™ at all major mmW 5G bands – 24/26 GHz, 28 GHz, and 39 GHz to our customers. 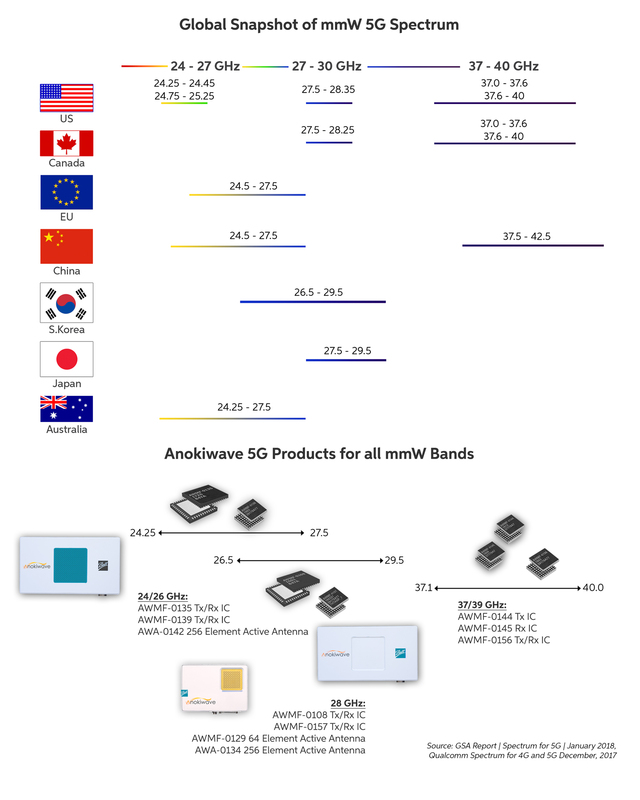 Anokiwave was first in the market with Generation 1 5G ICs in 2016 and 2017, and have recently introduced our new 5G Gen-2 IC family that supports 3GPP compliance across all bands – 24/26 GHz, 28 GHz, and 37/39 GHz. We also offer Active Antenna Innovator Kits, based on our ICs to demonstrate the performance achievable using low power silicon integration and efficient antenna layout and design. As additional mmW bands become available, you can count on Anokiwave to lead the way with innovative IC solutions. Interested in joining us? Check out some of our career openings. Download the full text of chairman Pai's address at MWC2018.